On December 9th, exactly two years ago, I received a document that would change my life forever. It was an advanced cholesterol test known as an NMR (Nuclear Magnetic Resonance). I had only taken one before that, about two weeks earlier at the end of November. That first test had put me into a depression. I saw that my LDL cholesterol (LDL-C) had skyrocketed from my average of 130 to 239, and my LDL particle count (LDL-P) was a whopping 2,705. I had never measured my LDL-P before then, but I knew the “reference range” for it was below 1,000. I decided to schedule the December 9th test, hoping it might suggest this first one was a lab error. And for 15 long days, I dropped everything I was doing to read and learn all that I could about cholesterol and the lipid system that trafficks it. Surprisingly, I found this system had quite a lot in common with networks in my own field of software engineering. In fact, I started to wonder if I was simply projecting my own beliefs where they didn’t belong, as a way to cope with this miserable time. When my results came in for the December 9th test, there was a resounding “click” in my head! You see, while I was experiencing this terrible depression, my appetite waned. I resolved I wouldn’t eat one more bite of saturated fat than I was truly hungry for. This led to my eating about 1/3rd of the calories I normally do, even while still being on a ketogenic ratio. So overall, my dietary fat dropped significantly. Thus, if my dietary fat was way, way down — then my LDL-C and LDL-P would have presumably dropped, right? Instead, my total and LDL cholesterol had gone even higher! This was indeed an energy distribution system above all else. Cholesterol is a passenger, not a driver. I had a lot of work ahead of me! Here I am a couple years later, and I can remember that moment like it was yesterday. I was alone and determined when this all began, but now I’m proud to share this journey with so many others who are helping to change the paradigm. Hi Dave, I want to thank you for your priceless research. My life changed in a similar way in June 2012, ‘numbers’ confirmed six months later and again in August 2014. After that I didn’t see much point in testing further, because my body and my mind told me I was doing great and I figured it didn’t matter what those damn stubborn LDL figures said. That, and I was tired of the guilts from the docs who told me I shouldn’t believe what I was reading on the internet. Even though I had to tell them what an apolipoprotein is. I’ll probably test again considering I’m now able to test privately, but avoiding a lecture and the mandatory statin prescription is expensive, so it’ll wait until I’m feeling flush with cash, if that ever happens. As is not unusual, all but the total and ldl-c went in the ‘right’ direction. Of particular interest to me was Lp(a) which reduced by a third on high fat. Thanks again. Your work is incredibly valuable. Thank you so much for your kind words, Adam. It’s the many great stories of people reviewing my work and making their own decisions that drive so much of this journey for me. 1) My diet stayed pretty much the same du ring these 2 tests. Why is it that my hdl went down so much? I may have exercised a little less in 2017, could that be it? Or does hdl also fluctuate quite a bit? 2) Also, is it pretty much universal that the Freidwald method for figuring ldl is very inaccurate if low trigs? Using the iranian method my ldl should be closer to 139 in 2017. Really appreciate all your work. Thank you for your time. 1) If I were to guess, yes, less exercise. I’m about to hit almost 100 blood draws since Nov ’15 and I have discreet periods between my non-distance running time (not quite sedentary, but lower exercise) and my distance running (not hyper-athletic, just cross the finish line-like). My avg HDL-C when not training is 68.4, average when training/running is 76. 2) Yeah, all my data is using Friedewald — but not because I like it, it’s because it is universally *used* so I want to maintain apples to apples comparisons for everyone. Using a different equation that gives a lower score is kind of moot to me anyway since I don’t really care as to whether it is “high” or not, only that it makes mechanistic sense given the experiment/theory at that time. Would i be considered a lmhr? Or numbers aren’t high enough? Ok, so here is a quick lowdown on where I am and the reasons why I am panicking slightly as my numbers are not looking good. •	I am 39 yo, weigh 189lbs (85kgs) and have a BMI of just under 25 (although not carrying much fat at all, approx. 15% body fat). •	LCHF for 5 yrs – slowly fell off the wagon about 18 months ago due to 2nd child and working away from home a lot with no control of my food (military). When I was home my wife generally prepared food for me coming in from work that was relatively LCHF. •	I have never smoked and rarely drink alcohol. •	Keto for last 10 weeks with great results for weight loss, but not had that energy spike or mental clarity often spoken, I suspect I am . •	Tested blood ketones and they are normally between 0.5 – 1.5mmol but on occasions are either side of that band. •	Father had heart attack at 56, gall stones about a yr later and gall bladder removal shortly afterwards. Has had 2 attacks of acute pancreatitis in last yr.
•	I never exercised more than was required to pass my fitness test but have decided something has to change and have ramped this up and doing about 4+ hrs a week of slow and steady ~70% Max Heart Rate. Test Results 28 Nov 17 – Doctor STILL didn’t listen about VLDL measurement request but did do a hsCRP and a few other random things. I now appear to be going the other way with a 40% increase in Tri and a 30% drop in HDL… Any ideas where to go from here or what it all means? Test results 12 Dec 17 – Doctor had a severe case of know-better-itis, so threw money at the problem and ordered a Lipoprotein Subfractionation blood test myself and paid for it. I was so worried about my lipid levels and the fact I was mainly LCHF for the last 5 yrs so had a Calcium Heart CT Scan 2 weeks ago – My CAC came back with a score of 0, which is good… And bad. I am only 39, so technically a little young for a CAC so this could provide a false positive, although I am not sure that is entirely the case as I think my cardiac health is good, although I have absolutely no proof of that and my numbers certainly don’t appear to show that. I am at a point now where I have 2 young children and I am really beginning to fear my risk for CVD is so high that I will end up dying before seeing them grow up, which really concerns me. I have thrown myself into Keto and have been doing well, but no matter what interpretation you make of my lipids, they are not great to say the least. 1. Are my cholesterol numbers bad or am I just being paranoid and/or missing something obvious? 2. What foods or actions help to reduce Triglycerides and LDL? 3. What foods or actions help to increase HDL? 4. Why am I NOT seeing lipids moving in the right direction? Thanks in advance for any advice or help as I am pretty scared about my future with my children. I now appear to be going the other way with a 40% increase in Tri and a 30% drop in HDL from previous readings… Any ideas where to go from here or what it all means? Lots to unpack. Thanks for the detailed explanation, it makes my analysis easier. 1) It sounds like you’re struggling to maintain the stability of a keto diet given your current responsibilities both home and career-wise. Beyond adherence to the diet itself, this can be its own stressor, of course. Get used to insisting you “take your health very seriously” now that you are a young father. This helps to push back on the natural social pressures that come with diet in general. 2) You’ve also been on it a short period (in the strict sense), and actively losing weight, which can disrupt lipid numbers as well. — Okay, with those said, given what I’m seeing in your pattern change, my number one suspect is that your diet changed between the Nov 20th test and the 28th test. Specifically, I wonder if either your overall calories went down and/or your specific fat quantity alone went down in the days just before the last test by comparison. If you can, recall as much as possible what you ate in the days before each test and how it differed. — The degree with which your HDL dropped is unusual to be sure, but this can often be related to an immune response. So we should also consider the possibility of your having gotten sick (even if you don’t feel symptoms). — Obviously, the positive to take right away is how fluid and dynamic cholesterol numbers are — which is what my research keeps exposing over and over again. Your own doctor clearly needs to acknowledge this given these the were ordered by him/her and are just one week apart. — Not too sure about analyzing the particle count yet as I rarely see them only a couple months into the diet. I’d suggest waiting a longer period of settlement first. >>> Freakout-worthy? In my opinion, no. Again, I’m not a medical professional and this isn’t medical advice. So with that said, I do think you’re in a tough spot of trying to extract a signal while there’s a lot of noise around. You want to (1) have a prolonged period of routine with both your diet and lifestyle to be sure the bloodwork reflects a proper baseline. (2) As annoying as this is to hear, you need to gather that information while not being too stressed out about it — because stress itself has potential pathways to changing your lipid numbers. (3) To help you with #2, note that you ALREADY HAVE strong evidence of how dynamic this is anyway. Thanks so much for your response, I get you arent a medical professional but it helps to have someone with a bit of(self) education on the subject of lipids giving their 2 pennies worth, it has put me at ease a little. 2. My macro breakdown since 25 Nov – Note it is total carbs and not net, which has consistently been 4 – 6%. My hsCRP was not elevated on 28 Nov, which I would have expected had I been ill, no? That being said, stress could clearly be a factor as I am worried about my CV health quite a lot, I am separated from my family by 7,000 miles and 7 time zones and working hard. I hadn’t actually considered this as a potential factor, so thanks for bringing that one up, more chill out and meditation required, ha ha. In addition, I have been in Keto since 1 Nov with blood ketone levels varying from 0.2 – 4.2 with an average of 1.0 which should help counter any inflammation, although not eradicate it. The particle count was done more out of frustration with my doctor not listening and more importantly, to give me a baseline to work from. This will pay dividends in the future hopefully. One thing I have noticed (anecdotally only, I will need to analyse this properly), I have started to consume more dairy to meet my fat needs, could this cause LDL to rise? I was eating coconut oil and Kerrygold butter before, perhaps this needs looking at in more detail and seeing what I can do to my lipids. I intend to have a particle count done every month for the forseeable future, I want to see what a month worth of tweaking parameters like eliminating dairy or coconut oil or more veg etc will do. I will continue to punch stuff into my master spreadsheet and keep crunching that data and see what I can come up with, I am happy to share this data if it would help you? Thanks again for all of your help, I really needed to hear someone tell me dont panic, ha ha. Really glad you’re logging. Definitely keep it up! – Yes, it is possible your hsCRP would be elevated if ill, but that’s not a certainty. – If from stress, one of the most reliable markers is Cortisol (at least, it has been correlative with my high frequency testing). – Dairy would have more saturated fat, relative to mono/poly, of course. Some seem to get lower LDLc by dropping down their saturated fat in favor of the other two. – You mentioned coconut oil. As it happens, coconut and MCT oil have been popping up as confounders for those doing my protocol, which is why I suggest avoiding them during the experiment. My guess is that it has to do with the higher short and medium chain fatty acids being metabolized differently with the portal vein=>liver. I’d have thought it would be the other way around (lower LDL), but anecdotally, it seems to often result in higher LDL. – Yeah, again, I can’t comment as a medical professional, yadda yadda — but your numbers don’t concern me that much. Really, the one thing I’d most want to change is your HDL-C.
Hi Dave, firstly thanks for all this great work you are doing! I’m a 49 years old bloke in the United Kingdom. 3 years ago I had a cholesterol test showing my total cholesterol as 6 mmol/l / 232 mg/dl. I was told it was a little high and I needed to exercise and lose a little more weight. I’m 5′ 11″ and was over 13 stone. So I started doing more exercise and changed my diet, initially trying to stick to paleo but in reality more focused upon getting enough protein and sometimes slipping to have pizza. I tried to eat no bread, pasta, rice, cakes or biscuits. I did lose some weight and added muscle as I hoped. This was a low carb and high protein diet effectively. Then 18 months ago my exercise venue was shut down and my exercise dropped off. This past summer, conscious of my reduced exercise and still wanting to reduce my body fat I came across keto and switched to a LCHF diet. Going keto I felt pretty good and lost some belly fat but also some muscle mass. I think this was due to not eating enough protein and the lack of exercise. Also I found that my appetite shrank on LCHF and ultimately recently I was eating between 700 and 1,000 calories per day generally. Whereas I understand my maintenance level should be around 2,000 calories per day. So when it came to get a new cholesterol test a month ago the result was 9.1 mmol/l / 352 mg/dl. This got me referred to my doctor for a more detailed blood test which I had 10 days later. I had never actually tested to see if I was in Ketosis at all so got some ketostix – and tried but a zero result from them. So pretty much no change from 9.1 to 8.9 as expected. This was flagged up as maybe reflecting familial hypercholesterolaemia. I told the nurse it was actually likely due to my keto diet but she knew nothing about ldl-p for example. I asked if I could arrange a follow up blood test (as I had seen your experiments) but she stated that it would have to be in at least 3 months time as it would take at least that long for a dietary change to impact the cholesterol score. I was told if my Cholesterol level didn’t come down below 5 mmol/l / 193 mg/dl the doctor would want me to take statins. Which is not an option as far as I am concerned. So I decided to try a few things on my own before resorting to abandoning keto and forcing myself to eat wheat again permanently. I can’t afford full blood tests privately at the moment so have opted for home testing kits (from the chemist) that purely (and perhaps not accurately) test the total cholesterol score. Hoping to get a general reduction showing from a sequence of tests even if the figures were not accurate. For the 3 low days I made sure I was on around 750 calories though in reality I had been like that for some time. Total calories: 728 : 64% (50g) fat, 25% (43g) protein and 11% (20g) carbs. Total calories: 743 ; 50% (42g) fat, 44% (83g) protein and 6% (11g) carbs. Total calories: 1,006 : 41% (33g) fat, 33% (60g) protein and 26% (47g) carbs. (a bit of a slip here as I got dragged to the pub and had two pints of beer). Despite the beer carb slip the hour before I started to fast pre blood test, the following day 4 blood test resulted in a cholesterol score off the chart. My score was definitely over 7.8 mmol/l / 300 mg/dl. So a reasonable control starting point. I suspect it was around 9 mmol/l / 350 mg/dl as per my two prior blood tests. Total calories: 3,972 : 78% (346g) fat, 14% (136g) protein and 8% (84g) carbs. Total calories: 3,647 : 79% (318g) fat, 13% (120g) protein and 8% (70g) carbs. Total calories: 4,360 : 85% (413g) fat, 8% (91g) protein and 6% (68g) carbs. I really struggled with the amount of food but learnt to boost it with double cream. So the next morning was my second home blood test with the following total cholesterol result of 7 mmol/l / 275 mg/dl. So the inversion pattern and the feldman protocol drop was showing up for me even if my total cholesterol at this stage was still far too high (for the doctor). Total calories: 2,018 : 48% (104g) fat, 31% (155g) protein and 21% (104g) carbs. Total calories: 2,093 : 49% (112g) fat, 30% (152g) protein and 21% (107g) carbs. Total calories: 1,957 : 47% (100g) fat, 32% (152g) protein and 21% (102g) carbs. Followed by another home blood total cholesterol test result of the same 7 mmol/l / 275 mg/dl. It may well have dropped slightly (the test chart is a little vague). I had expected a decent drop given your carb swap experiment but perhaps I just wasn’t eating enough at 2,000 calories? Total calories: 1,854 : 34% (68g) fat, 25% (109g) protein and 42% (196g) carbs. Total calories: 1,840 : 39% (79g) fat, 23% (105g) protein and 38% (174g) carbs. Total calories: 1,894 : 34% (70g) fat, 27% (127g) protein and 39% (185g) carbs. Followed by another home blood total cholesterol test result of again 7 mmol/l / 275 mg/dl. Now these home test kits are not especially reliable, but I did use the ones that had had the best reviews and thought to be the most reliable (best of a bad bunch?). So I was expecting to see some movement on the chart even if the numbers were not particularly accurate. Total calories: 1,790 : 70% (141g) fat, 24% (110g) protein and 6% (26g) carbs. Total calories: 1,881 : 66% (139g) fat, 28% (130g) protein and 6% (30g) carbs. Total calories: 1,942 : 80% (173g) fat, 17% (82g) protein and 3% (12g) carbs. So I didn’t see a drop or raise on any of these last three diet changes. I’m don’t know if I blame the home testing kit (which has a range from 3.9 / 150 mg/dl to 7.8 / 300+ mg/dl) or just that my body doesn’t adapt. So now I’m going to just enjoy Christmas and eat what I want. During this past month I’ve been doing more and more research which has resulted in me being more relaxed about the LDL score. Though I would appreciate any comments about my doctor blood test results (TC = 344, Tri=115, HDL=54, LDL=267). My understanding is that the best simple blood test indicator of CVDR nowadays is ratio of Tri to HDL? So mine would be 115 / 54 = 2.12 which seems okay and indicates my LDL-P should be okay too (larger rather than smaller LDL). If I can get my trig lower I would be happier still – maybe I will be able to do a carb swap experiment in the new year with more detailed blood tests to back it up. If the doctor is still not happy around March I will get a more detailed blood test to check for insulin resistance and inflammation markers etc. One last thought, I have had quite a lot of stress this past year and understand that can cause LDL to rise (how and why that can happen I have no idea). Lots of great data you’re sharing! Cheers! Your posted numbers [ TC = 344, Tri=115, HDL=54, LDL=267 ] is pretty standard for a hyper-responder. If you exercise and lose more body fat while gaining lean muscle mass, your HDL and LDL will likely go up and your TG will likely go down. Yes, I like the TG/HDL ratio. But overall, I just like seeing low TG because it means that whatever the quantity of your LDLc (and likely LDLp), it was necessary to traffic the existing payload of energy your body needs. Take a look at Table 2 in this study: http://circoutcomes.ahajournals.org/content/circcvoq/9/3/206.full.pdf I’ll be doing a post on this soon. But your risk scoring would be in column 6 row 9 for a 0.9 (High HDL + TG > 100 + LDL > 130), which is just below the baseline of 1.0 (lower is better). Note that the baseline is Low HDL + TG < 100, LDL < 100 -- and that's actually a *worse* outcome than your category. and the great link! – I’m not used to reading studies so look forward to your post that might help explain to the likes of me. Is it right that higher HDL goes a significant way to offset risk from higher LDL? – that is how I read it as there is no low HDL result with a risk less than 1. If I read that table2 correctly, my risk may come down if I got the trigs under 100. And that would be the same risk as if I got LDL down below 130! The TG<150, LDL≥130 row has an even lower risk of 0.8; so that's a bit of an anomaly? If someone did a large study like this with higher LDL numbers that would be ideal. – Yes, HDL being high is an extremely good indicator. Your 54 is already an excellent score (and puts you in the “High” group). – Yes, having under 100 TG is indicative of lower risk because it means your *usage* of fat-based energy is high. This is why it is typically very low with Lean Mass Hyper-responders, even when their LDL is extremely high. – FWIW, I want you to know the general directions of positive outcome, at least as the science is telling us. But as you can see from the table, it doesn’t fit the narrative we’re often told. Many doctors don’t really care much about TG and HDL so long as your LDL is low. And clearly, that’s not the most relevant factor by a longshot. Hi Dave. Thanks so much for the work you have been doing 🙂 Groundbreaking! I’ve just had my 1st basic cholesterol test results since starting a Keto diet 12 months’ ago. I’m a little different from most people, as I have had high lp(a) in the past and have had Dientamoeba Fragilis / parasites infection from Aug 2015 to Sept 2016. Since then I’ve had HPA Axis Dysfunction / Adrenal Fatigue. Is there an email address I can send you a pdf of my blood test results? I’d like to make them available to add to your research. Hey Dave: Migrating the basics of my previous Twitter conversation to this space. So what determines whether the body ups its LDLp or LDLc to provide transport to carry energy? Can we narrow this down even further and ask whether it’s ALWAYS the body’s 1st choice to use LDLp to ferry fuel? If LDLp is the most optimal transport vehicle, it must chemically be more suited to the task, right? If this logic is correct, then why would some people inherently produce lots of LDLc, if it serves no function (unless your research has found LDLc to be essential in other ways)? What’s so confusing is that certain literature has cast LDLp as the “evil” LDL. Has your research determined that LDLp is, in fact, the best type of LDL for transport? The fluffy cloud-like image of LDLc frankly suggests a passive entity, not the sort of streamlined substance eager to take energy to its destination. Thank you, Dave, for all you do! LDL-P is a measure of the number of LDL particles not a type of LDL. LDL-C is a measure of the amount of cholesterol mass in the LDL particles not a type of LDL. There are two types of LDL: pattern A (large particles) and pattern B (small particles). A low LDL-P result equals more large particles (pattern A) which is deemed good. A high LDL-P result equals more small particles (pattern B) which is deemed bad. Eating sugar and carbs leads to pattern B and eating saturated fats leads to pattern A. Hope that clarifies and happy to be corrected if I’m wrong. Agree with Ade on the above points. – Technically, LDLp is the “later stage” of VLDL. (VLDL at start, then potentially to IDL, then to LDL) The VLDL stage is where the TG is provided, the LDL to follow is more “on patrol” to help out. So while both VLDL and LDL have slightly different characteristics, the first is usually the precursor to the second. The tricky part is that I can’t say for sure why some people tend toward higher LDLp (body wants more on patrol) than others, but without question, the highest correlation appears to be lean and or fit (Lean Mass Hyper-responders being the far end of the spectrum). – It’s deceptive to see a lot of LDLc and assume the body is actually *producing* more — it is more likely *circulating* more. Again, cholesterol is actually unlikely to be used on any given trip it takes in an LDLp and can be repackaged back into another VLDLp for another tour, returning again in the resulting LDLp and so on. That is, if it doesn’t have another fate such as hormone or bile salt production. – Yeah, for me, the LDLc vs LDLp literature is pretty much out the door. Hyper-responders often have their LDLc and LDLp track in a fairly predictable way. You can multiply LDLc by 10, and that will be the LDLp +/-400 most of the time. Again, this makes mechanistic sense as the payloads for LDLc are pretty consistent when being placed in their VLDLs at the beginning of the journey. Hi again. I’ve decided to put my blood test results below so everyone can see them and add to the data on cholesterol and Keto / Low Carb. 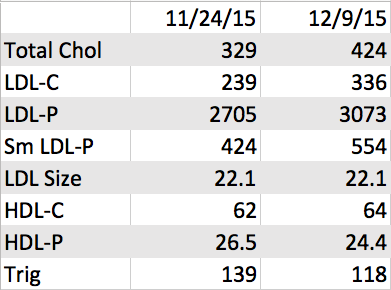 From Feb 2014 to Feb 2015 I was on Crestor statin due to the above Lp(a) and LDL and TC. In Aug 2015 – Sept 2016 I had Dientamoeba Fragilis parasites, which gave me among other symptoms, gut pain every day. I took lots of antibiotics to get rid of them, but now have Adrenal Fatigue and haven’t exercised much at all since Aug 2015. My body fat is about 20%. Started Keto diet Dec 2016, most of the time cows milk / dairy free. My doctor was overall happy with my cholesterol results, but wants to retest in June 2018 as he’s concerned about my TC and LDL. I have fatty bacon nearly every morning and lots of olive oil. I mentioned this site briefly and the fact that my sdLDL should be very low, which is good for cardiovascular risk. My Adrenal Fatigue is showing some signs of improving. Any comments or suggestions for my GP would be appreciated. Thanks! Thanks for adding your data, David! Obviously, I’m liking your low TG from the last test — but what about your HDL? My guess is that it improved a lot given your TC went a lot higher without your LDL doing likewise. Also great news on the Lp(a) reduction. Although I’m not familiar with those unit ranges (we ‘mericans like to have all our own units of measurements… sigh). Dave, I’m 53 yo female. Started Low Carb High Fat (not Keto) back in June. Lost 15 pounds in the first 3 months, maintaining since then. I’d like to lose 10 more pounds. Below 25 BMI now. (5’3″ tall). Heart Disease runs in the family. Which blood tests do you recommend I get at this point? I want to be informed and armed with info when I head to the doc next year and she freaks at my LDL. I’m willing to pay for the blood tests (to a point), so which tests are most informative? Thank You! Could this explain the caution about to much protein? Maybe it’s really the BCAAs? What I find confusing, they seemed to achieve favorable health benefits and rapid fat loss on a protein-restricted (to achieve low BCAA) and High carbohydrate diet. If the subject are eating all these carbs, they can’t be in ketosis. So, how are they burning fat? I’ve been LCHF for over a year. I don’t really track too carefully and slip up occasionally. I am also a marathon runner. I just had my blood tests done recently and have been baffled about the results. I’m in Canada but did convert them. I am 46 years old. I am 5ft 4.5″ and weigh 115-123 range. My doctor never called me regarding these results but they have me a little freaked out. What is your opinion? I get confused because I hear conflicting information. Some say high cholesterol is fine but then even the LCHF/Keto groups talk about lowering int. Thanks. Your LDL being higher is common for a low carb runner. In fact, if anything, it’s a lot lower than I’d expect. Whether you want to take action in lowering it is a personal decision. Many are confident their numbers are fine, many would prefer to “play it safe” and seek to lower them, even if it means leaving keto. I myself often say on a 10 scale of concern, I started at a 9, but now I’m more like a 5 — however, I’m *not* a 0 (and I doubt I ever will be). Hey Dave, I’ve been strict LCHF for 8 months (less than 50 grams of carbs/day). Lost 15 pounds. 53 y.o. female. Here are my recent blood test results. Freaking me out a lot. After 8 months with low carbs, shouldn’t my triglycerides be way lower? And that CRP!!! It’s scary to see “HIGH” after just about every test score. Should I keep a defibrillator near by? Thanks for all you do, Dave! Your TG being at 159 is a *tad* high, but not terribly uncommon. You may need to cut back a bit more on carbs as this suggests a surplus when HDL isn’t bottoming out with it (and your HDL appears fine). I often call CRP the Let’s Investigate Further marker. It can be elevated for a lot of reasons, many of them transitional. Mine is usually under 1.0, *however* I’ve had it as high as 52.96 in 24 hours following a half marathon. I’ve likewise had it go up to 4.55 when I was very mildly sick. I’ll have a blog post on it soon. And the LDL-P number? and Small LDL-P? Both just reflecting carbs? I feel like I’m not getting many (any) other than from berries and veggies. Guess I’ll stay away from those for a while and re-test. I’ll have that information soon in a data dump I’m doing for the experiment. The impact of carbs I suspect to be very individual, so I can’t speculate on that very easily for other people.